This camera along with my Pentax MG has great sentimental value for me. My father is also an anthropologist and this was his field camera. I note with interest that the SPII was (according to some sites) released in 1971, the year after I was born. My father was doing fieldwork in Indonesia and we have many black and white family photos from that time. Did he buy it to document me as well as his field informants? Using the text or images on this website without permission on an ebay auction or any other site is a violation of federal law. 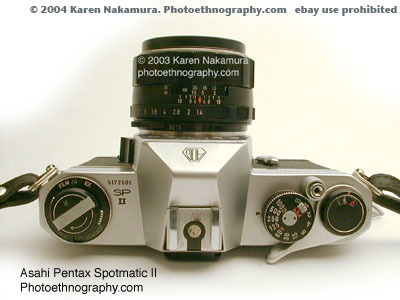 I recently asked my dad about this and he says this was actually his second Pentax. The first one he bought before his field research (1970) but while in the field in Indonesia, the lens became coated with a nice layer of mold (a common problem even now in humid areas). He sold the camera to one of his local friends and picked up the SPII in Singapore. When I turned 16 (in the mid 1980s), I took a photography course at my high school in Japan. My father gave me his SPII for the class. That course gave me my love of photography and the SPII was a wonderful camera to use. I adored its match-needle type, stopped-down metering. It taught me more about proper exposure and depth of field than any modern, all-automatic camera. Tri-X in D76 was my combination of choice. Over two decades later, I still have the bug! And I'm still using Tri-X and D76! Somethings never change. Unfortunately, after my first year of college I did something stupid. I put the SPII in my checked luggage. I had wrapped it in towels, thinking it'd be OK but it wasn't. It broke in transit (darn you United Airlines!). I took it to Asahi repairs in Tokyo and they said it would be more expensive to fix than it would be worth. I ended up buying an EOS 620 to replace it and that began my second love affair with cameras. My Spotmatic SPII went on a shelf in my dad's house. Using the text or images on this website without permission on an ebay auction or any other site is a violation of federal law. After I got a real day job and income, I finally got around to repairing my SPII which I recovered from my dad. It occupies a special part of my photographic personal history as well as personal family history. I sent it to Mark Hama in Georgia. Even including the 8 days it was in transit, he returned it in 12 days! He totally restored it to working condition and even threw in a new S400PX battery! His price was very reasonable, the repair was fantastic, and I recommend him highly! The SPII has stop-down, match-needle exposure metering. You flip a switch on the left side of the lens mount, which 1) stops down the viewing lens to the aperture you've selected and 2) turns on the metering circuitry. There's a little needle on the right side of the viewfinder that goes from high (too much light, stop down) to low (too little light, open up). What I like about match-needle (as opposed to match-diode) exposure metering is that you can tell exactly how much light you need to add or lose. What I also like about the SPII is that when you engage the meter, you automagically get Depth of Field (DoF) preview, something that even some expensive contemporary cameras don't have. The fixed focal length Super-Takumars that came with the Spotmatics easily were at the top of their class when they came out and they still best all of the plastic consumer level zoom lenses that people buy these days. They were multi-coated with a very hard coating process. If you see a Super-Takumar, buy it. 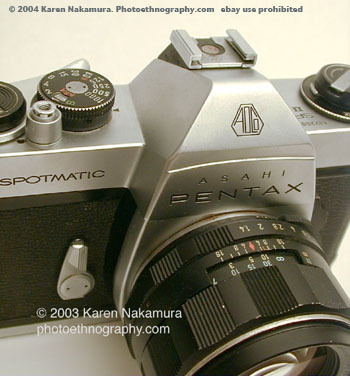 Availability of batteries for the Spotmatic is better than other cameras of the era because the Asahi engineers built in a bridge circuit in the metering which makes it battery voltage independent. This means you can use the original 1.35 mercury PX400 battery, or a 1.5V silver-oxide replacement without problems. An exact fit PX400S is available, or you can use a #392 cell with a small rubber-O ring (purchasable at any fine home repair center or DIY store) as a spacer. I believe a #397 also fits as well. (when Mark Hama repaired my camera, he replaced the battery with a silver-oxide "Exell S400PX" cell). Note: Using the text or images on this site in an ebay auction without permission is a violation of your ebay Terms of Service. I will report you to ebay if I discover such a violation taking place. This may result in your account being cancelled. I also reserve the right to file claim for civil penalties. with my career. So, naturally I was interested in your ethnography concept. The home page photo on your website is lovely. I'd really like your website, I learned a lot about cameras. I have only one camera (asahi pentax SP), a friend gave it to me because his father gave him as a present and he doesn't make any photography. I began for two years and my first reel was a success. I'm from France (Strasbourg) and it offers many possibilities to take great photographies at night but it is so cold these nights ! I am a high school photography student and I was shooting outside today after sunset in the Canadian winter. As I pushed down the shutter, my viewfinder became black, as it usually would when I take a photo. However, this time the viewfinder remained black for a very long period of time. It's been at least 10 minutes and my viewfinder is still black. I've tried playing around with the external options (aperture, shutter speed, focus) and I've even tried taking another photo after turning the film advance lever. Nothing has happened. Please help because I have to take 36 shots this weekend and this camera is borrowed from my school! It sounds like your mirror is stuck in the up position, most likely because of the cold weather. I'd take it back in somewhere warm and keep dry firing the shutter (with no film in the camera). It might eventually loosen up and the mirror will drop back down again. Otherwise, you'll have to take it in for repair. Unfortunately, most of the repair stores have gone out of business. Especially as it's your school's camera, they might understand that the camera broke but you didn't necessarily break it and not charge you for the repair.